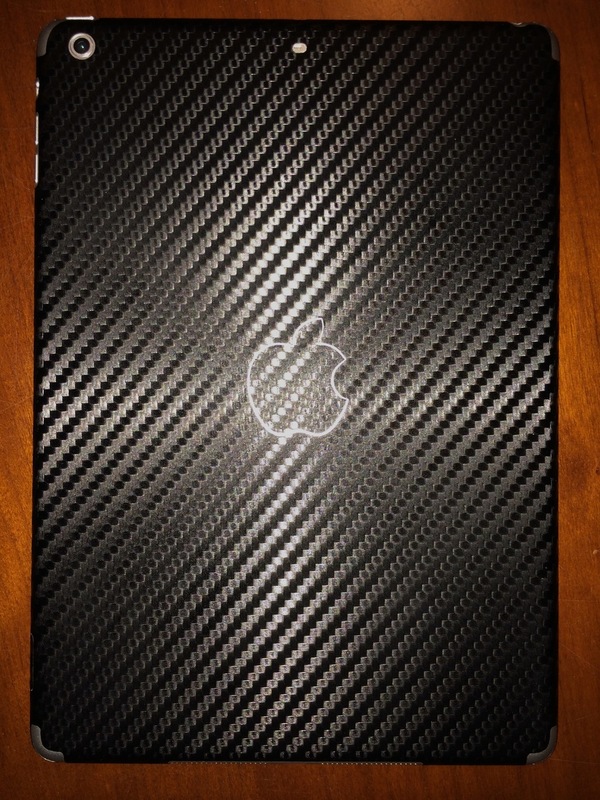 During the holiday sales I picked up one of the Bodyguardz Armor for iPad Air. This past November I wrote a post about how I was experimenting with NOT using a case with my iPad Air. Well, the Bodyguardz Armor is most certainly not a case, so my experiment continues. I did, however, want to have some minimal amount of protection for my iPad Air. The Bodyguardz Armor seemed like it might fit the bill. What is the Bodyguardz Armor? It's essentially a carbon fiber looking sticker that you put on the back and sides of your device to protect it from scratches and dings. It also comes with an anti-glare screen protector/film for the front of the device. Installation was easy, peel back 1/4 of the adhesive sticker and adhere that 1/4 of the film to the installation surface and once you are happy with the placement you peel back the rest of the cover over the adhesive and press down the rest of the way. Overall I'm pretty happy with the Bodyguardz Armor. The first time I tuned my iPad on after installing the anti-glare film I almost took the film off. I immediately noticed a pretty large degradation in the screen image quality. (To be fair, this is a known down-side for an anti-glare screen protector) But I decided to give the film a try for a while and I'm glad I did. I got used to the reduced image quality and soon realized that the anti-glare and anti-fingerprint properties of the film far outweighed the negative aspect of the reduced resolution. Not everyone will agree with me that this is a good trade to make, but because of how often I use my iPad and where I use it... it was a good trade-off to make. The Bodyguardz Armor is not for everyone. If you are even slightly hard on your electronic devices you will want something with more protection. If you are a stickler for having the absolute best image quality on your iPad screen you won't like the anti-glare film but you may still want to buy the Armor and just not use the film. If you are like me and just want some minimal protection and something to make your "naked" iPad standout a bit from everyone else's iPad, this might be the product for you.